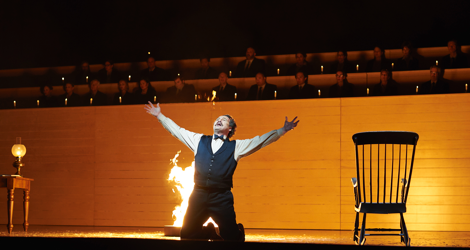 The Canadian Opera Company gives Harry Somers’s Louis Riel, often called the greatest Canadian opera ever written, the best production one could ever hope for. With 39 named characters and 17 scenes, Mavor Moore’s libretto aims at grandeur over drama, and the opera too often feels like a series of tableaux vivants that hardly convey mounting tension. But despite this, Russell Braun gives an incandescent performance as Riel that is absolutely thrilling. He fully embodies the charismatic Métis leader in whom a longing for justice vies with an inclination to madness. The other 29 soloists and the two choruses impress with their total commitment to the work. Peter Hinton’s direction lends the opera a cohesiveness and sense of purpose it would otherwise lack. The opera, premiered by the COC in 1967 for Canada’s centennial and now revived for the sesquicentennial, is an intensely political work set in the years from 1869 to 1885 about Canada’s westward expansion through the use of force and false promises. Sir John A. Macdonald (a richly comic James Westman) uses the Catholic Bishop Taché (a deeply earnest Alain Coulombe) to carry messages of amnesty to anti-government rebels in Manitoba led by Riel, only to follow up with military action. Johannes Debus leads the 67-member COC Orchestra in a fiery account of Somers’s eclectic score that veers from atonalism and electronic sounds to European and First Nations folk song, liturgical music and, to satirize Ottawa, music hall references. Highlights include Riel’s four virtuoso arias compellingly sung by Braun, the Kuyas aria appropriated from BC’s Nisga’a people beautifully sung by Simone Osborne and a Catholic mass strongly led by Jean-Philippe Fortier-Lazure. Since First Nations people were omitted from the original work, Hinton has employed two choruses. One, the Parliamentary Chorus, the opera’s original, sits above the action and comments. The new Land Assembly is a silent chorus composed of Métis and First Nations performers who interact with events on the ground. The group is powerfully embodied by Métis singer/actor Jani Lauzon, whose questioning gaze haunts both Riel and us. Thus, Hinton reframes the opera to depict Macdonald and Riel as fighting over land that belongs to neither. This lends a profound unifying irony to the work that enhances the story as a tragedy for Riel and the Land Assembly and a highly ambiguous triumph for everyone else. Note: This review appeared in NOW Magazine on April 25, 2017. Photo: Russell Braun as Louis Riel. ©2017 Sophie l’Anson. For tickets, visit www.coc.ca, https://nac-cna.ca or www.grandtheatre.qc.ca.